Its a new beginning as four time Eisner-nominated Best Writer Ed Brubaker makes his Marvel debut, joined by white-hot artist Steve Epting! As the new regular creative team, they will take Caps life in directions fans will never see coming! 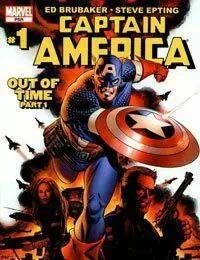 In just this first issue, the Red Skull lays the groundwork for his most devastating attack ever on Captain America and the land he holds dear...and with the Cosmic Cube in his possession, how can Cap hope to stop him? Find out in the shocking twist-ending that will have everybody in the industry talking!